“The beauty of ‘Russophobia’ from Russia’s perspective is that it absolves Moscow of any responsibility for the consequences of its own actions — the annexation of Crimea, its military incursions into Georgia and eastern Ukraine, the shooting down of a Malaysian passenger jet and its repeated meddling in Western elections — and has turned the country into an innocent victim of, well, John McCain. But what to do now that, as Oleg Morozov, a member of the foreign affairs committee of the Duma, Russia’s upper house of Parliament, declared this week, ‘The enemy is dead’? 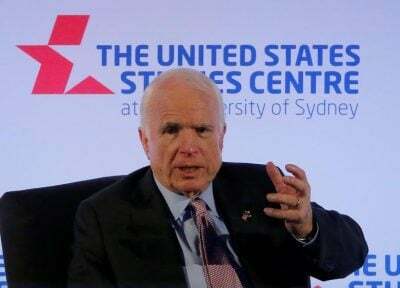 John McCain‘s anti-Russian biases were clearly evident before the political rise of the much despised (especially by the neocons and neolibs) Vladimir Putin. Around the time of NATO’s first wave of post-Soviet era expansion in 1999, McCain inaccurately portrayed the history of Poland and Russia in a PBS NewsHour segment. Michael Averko is a New York based foreign policy analyst and media critic.